« Behemoth of the Seas coming to Europe! Let’s start with a health warning: this is pure speculation, based on a tissue-thin rumour and bolstered by some frankly dubious theorising. 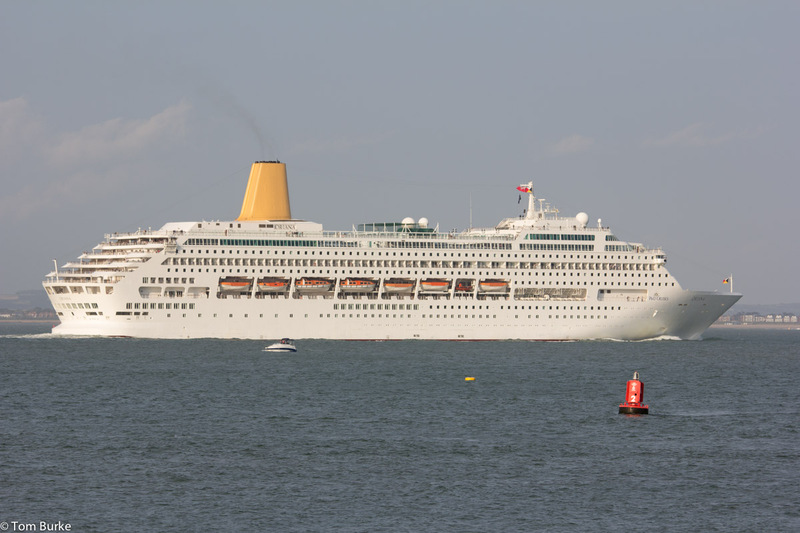 That said, is it possible that P&O might send Oriana to Australia? Permanently, I mean – to be a member of the P&O Australia fleet. The first Oriana was based in Sydney for the last five years of her operational life, from 1981 to 1986. That, plus the current ship’s visits to Australia while on world voyages, means that Oriana is a familiar name to Australians. I’ll be first to admit that there are big problems with this scenario. One of these is that P&O recently spent quite a bit of money taking out the children’s facilities from Oriana – she’s now adults-only – and I’ve read suggestions that any ship for the Australian market would have to include these facilities. Another objection is that P&O have just published the schedules for 2014, and Oriana is has a full set of itineraries for that year. However, the as-yet unnamed new ship doesn’t arrive until 2015, so there’s no conflict between Oriana going to Australia in 2015 and having a full European itinerary in 2014. As I say, this is all pure speculation, and it’s probably complete nonsense. But to me at least it seems to ring true, somehow. It’s still very unlikely, of course, but as any Terry Pratchett reader knows, million-to-one chances chances sometimes happen – in fact a genuine, cast-iron million-to-one chance is almost bound to come true. So if this time next year P&O announce Oriana’s transfer to P&O Australia – you heard it here first! Again just a rumour, but there was talk of Oceana being used as an Ocean Village ship in 2015/16. The brand being resurrected for the informal fly-cruise Med trips that P&O only recently ditched. This too may solve the P&O overcapacity problem if true. Having moved from OV to P&O I thought I would go back if ever the brand came back. Now I know that I wouldn’t and enjoy the P&O style of holiday. Thomson Cruises could be looking at a new ship for 2015 as leases on older vessels expire at the end of 2014. They have expressed interest at modernising the fleet with younger vessels, and Oceana would be a good size for them. Thomson already charter two ships from Carnival, and sub-charter a third. Could be a possibility then? I’m not sure about this one! I understand that Thomson need newer tonnage, but I can’t see P&O selling Oriana to them. If only because if Oriana shifted in the UK market then there’s a possibility that a lot of her regular passengers would shift with her…. Thomson are connected to Royal Caribbean via TUI. I would have thought that Thomson’s most likely route of acquiring newer but still second-hand tonnage would be from within that grouping – either an existing TUI ship as they introduce their own new-builds, or a ship from an older RCI class. I tend to agree that P&O are unlikely to sell Oriana to a UK based competitor. It may be they send Oceana to Australia/Asia where her three sister ships are based and apparently successful. A bigger play may be to send Azura to Australia if the new ship “ambience” is likely to be more Azura than Ventura (as I think I read somewhere). P&O would then have a mega ship to compete with Royal Caribbean and Celebrity in that market.